Mehldau assembled this five-hour account of his solo piano mastery from tapes of concerts he played from 2004 to 2014. Applying the power of his technique and the nuances of his harmonic thinking, he explores his own compositions and music by a dizzying variety of others, among them Johannes Brahms, Thelonious Monk, Harold Arlen, John Coltrane, Jerome Kern, Bobby Timmons, Leo Ferré and rock heroes of his youth: Kurt Cobain, Lennon & McCartney, Pink Floyd, Radiohead and The Beach Boys’ Brian Wilson. 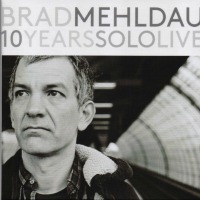 Mehldau makes it all work in a 4-CD or 8-LP continuum. Moving from a Brahms intermezzo to the Stone Temple Pilots’ “Interstate Love Song,” for instance, he supplies the listener a feeling for the pieces’ wistful minor-key harmonic kinship. Mehldau’s extensive, clearly written program notes are especially helpful after the listener has absorbed the music.